in ALL caps: Lube up!!! No, this won't be some weird post about Brokeback Mountain or something. It's about an album I recently picked up again after not having listened to it for years. 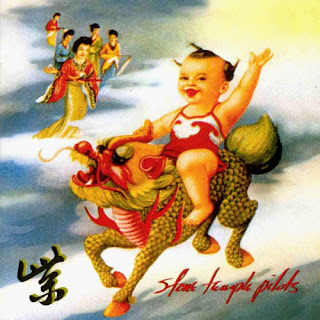 The second album by Stone Temple Pilots, Purple, could possibly be the best album of the 1990's. Yes. I said that. Better than the self-titled debut by Weezer, even. This is one of the very few albums I can listen to beginning to end and enjoy. That's how I base my own personal "rating system". So it'll differ with yours, no doubt. Well, of course, the song "Vasoline" is the first track I heard from it, and goddamnit-all if I still don't just absolutely love this song. So here it is. And as for another little ditty? How about Scott Weiland's solo career? Well, His first solo album, 12 Bar Blues, is mostly crap, to be honest. The first three songs on it I absolutely love, however. The following is the cut "Barbarella". It makes me feel all warm and fuzzy, like good - or bad - liquor. And somehow it doesn't take my self-respect away like the liquor does. And if you don't buy this stuff, I will make you eat my cooking. Seriously. You should be scared of that.